OfficeFurnitureDeals.com provides adjustable ergonomic workstations for sale online at up to 60% off retail. Our selection of height adjustable desks and sit to stand tables is the absolute best online. 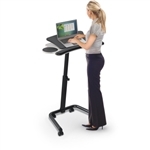 Here shoppers will find ergonomic workstations from industry leading brands like Global Total Office, Ergonomic Concepts, and Mayline with free shipping. The high quality ergonomic workstations found here encourage continuous movement in the workplace while simultaneously reducing fatigue by increasing blood flow. From private office environments to training room interiors, ergonomic workstations are ready to take your business productivity to the next level. 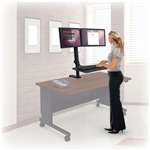 Have questions about the features and benefits of a specific ergonomic workstation? Feel free to contact our specialists at 800-456-6746 today. Your Price: $299.99 *Quantity Discounts Available! Your Price: $325.99 *Quantity Discounts Available! Your Price: $305.99 *Quantity Discounts Available! Your Price: $229.99 *Quantity Discounts Available! Your Price: $465.80 + Free Shipping! Your Price: $555.80 + Free Shipping! Your Price: $395.00 + Free Shipping! Your Price: $540.00 *Call for Additional Savings!